The Waeco PerfectPower 150 watt can size inverter does the job of providing 240 volts to power small consumer devices, but it does have some design limitations. On my last road trip to Tasmania, I found that the 12V DC charger adaptors for my phone and laptop were not powerful enough to recharge the batteries in a suitable length of time. I would spend all day driving with the 12V chargers connected, but still had only a half charge in the device at the end of the day. I decided that I wanted 240 volt power in the car for the next trip. I am now planning our next family holiday, which involves a road trip to Melbourne, and some time in the Victorian High Country. I do not run a dual battery set-up in my Toyota Prado. I use an icebox, rather than a fridge, and Coleman dual fuel cooking and lighting appliances, so my overall power needs on the road are fairly minimal. Really all I want to be able to do is to recharge my phone and laptop without having to stay at powered camp sites along the way. The Waeco PerfectPower 150 watt can size inverter is perfect for this. 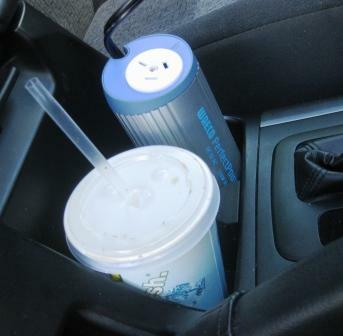 The idea behind can size power inverters is that they can be positioned in a cup holder in your car. This means that they are less likely to slide around the vehicle passenger compartment during driving, although a crash will still probably see them flying through the air. Think carefully about whether you want to have 240 volt power point sitting next to a full cup of coffee too. Big bump … slosh … zap! Not necessarily a good idea. I think that I will normally use my inverter positioned in the cup holder in the boot of my car intended for the third row of seats, which I remove from the car for camping or travelling. 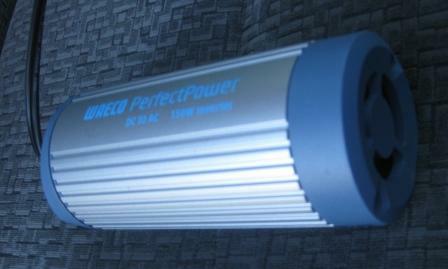 Waeco Perfect Power can size inverter — do you really want to sit it next to a cup full of fluid? The power inverter cooling fan is relatively loud and it can be annoying with how often it cuts in and out. The standard Toyota Prado power outlets are only rated to 120 watts (for all power outlets in the car) — the Waeco PerfectPower inverter can put out 150 watts continuous power. I am running low powered devices, so I do not expect that this will be a problem, and at worst should only blow a fuse. The Waeco manual indicates that the 12V DC accessory socket and power supply must be rated to at least 15 amps, which the Prado’s is. The power inverter fan is mounted in such a way that the fan outlet is blocked when used in a traditional cup holder with a solid base — application of a few adhesive plastic tabs should lift the inverter sufficiently to allow cooling air to pass out the bottom and back up the sides of the inverter. Perhaps Waeco could change their design? Jaycar has a similar Powertech branded power inverter, but it has similar limitations in that it is rated to continuous power of 150 W, and has the fan mounted such that use in a standard solid base cup holder would block the fan outlet. Engel also has a can-size inverter, but it only puts out 100 watts. The inverter does not have a fan, meaning that it can be used in a traditional solid bottom cup holder without blocking the air outlet. The inverter has a 240 volt outlet, as well as a powered USB outlet. Be aware that these power inverters are not pure sine wave inverters — otherwise known as dirty power. The Waeco manual indicates that your consumer device may heat up more than normal due to the non sine wave power. I have also read that non sine wave inverters may not provide sufficiently pure power for things like laptops and chargers, and may shorten their life. The usual disclaimer applies.